The Eagle 1 is a third-party accessory developed by QuickShot for the Sega Mega Drive. 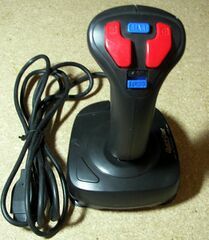 It is a joystick with three buttons and turbo features. It is not yet fully understood how this controller fundementally differs from the Python 3 aside from aesthetics. There is the possibilty that this model has six button support.